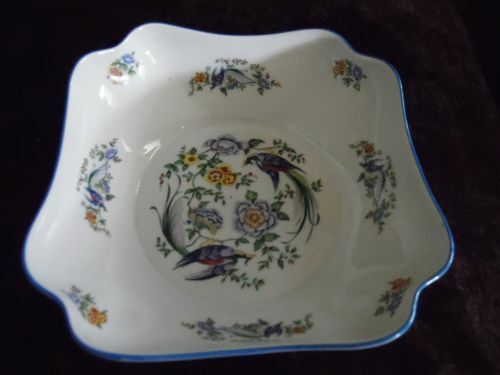 LEC Chamart Limoges Large Square Serving Bowl with Birds of Paradise & Flowers.This is a beautiful large bowl, approximately 9" square, up to 2 7/8" deep. 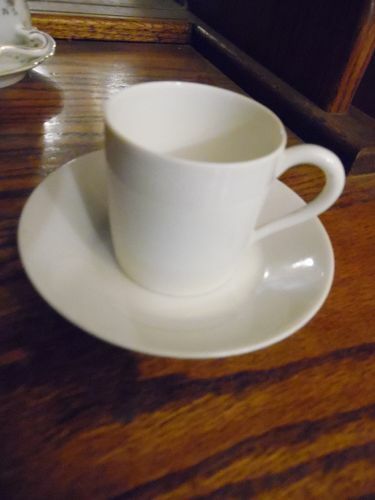 Fine translucent porcelain. Beautifully decorated inside and out with birds of paradise and flower arrangements in brilliant colors. 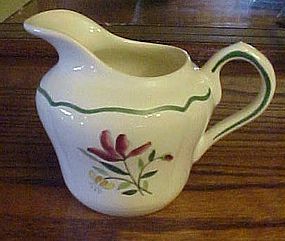 Made by Chamart in Limoges, France and accordingly marked. In excellent condition, no chips, no cracks, no crazing. Apparently never used. 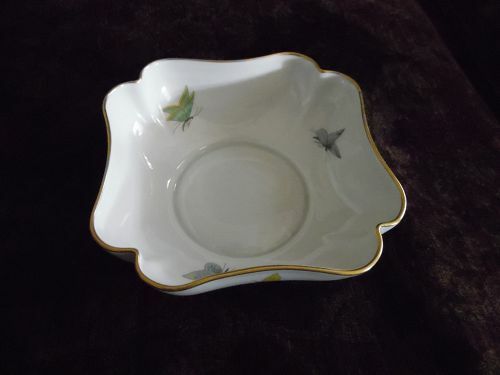 Beautiful scalloped bowl with butterflies, Vignaud Limoges, France. Pattern has butterflies on the both the interior and exterior sides of the bowl in lovely blues, pinks, yellows and greens and is finished with gold trim. 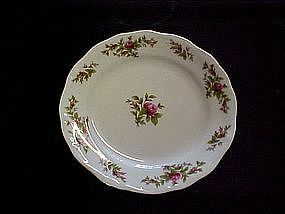 Bowl is stamped Limoges France and Measures 6 1/8” x 6 1/8” x 2 ¼” high. In very good condition free of chips, cracks, or repairs. Gold is bright and shiny with no wear. 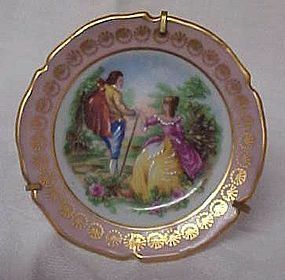 Beautiful little miniature Limoges Haviland France collectors plate with the hanger that can also be used as a stand. Hand painted accents and real gold filigree trim. Measures 3" diameter. 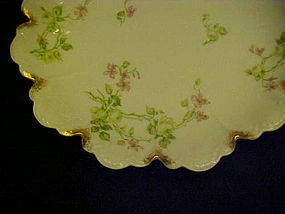 On the back it says: Made by Limoges France Haviland France. PERFECT condition. 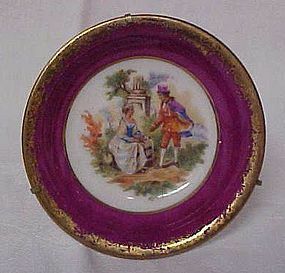 Limoges France Miniature plate with stand 2.75"
Beautiful little miniature Limoges collectors plate with a stand. Hand painted accents and real gold filigree trim. Measures 2.75" diameter. 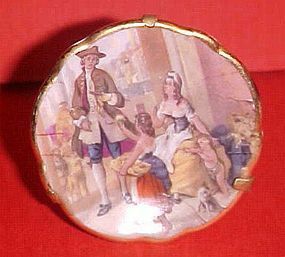 On the back it says: Porcelaine Artistique F M Limoges France. PERFECT condition. Lovely tumbler made by LeClair. 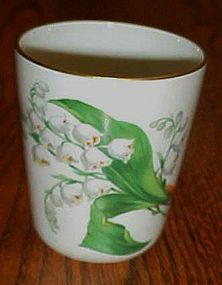 Marked LEC Limoges France and has a wonderful lily of the valley transfer. Gold trim and is in EXCELLENT condition with no damages or repairs. Gold is 100% bright! Measures 3 1/4" tall. Update: This is actually part of a dresser set, and is one of the accessories. Camart Limoges made this also. I have another piece listed also in this pattern. Lovely old covered jar or possibly a large sugar bowl made by LeClair. 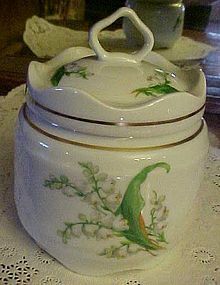 Marked LEC Limoges France and has a wonderful lily of the valley transfer. Scalloped bottom and lid. Gold trim and is in EXCELLENT condition with no damages or repairs. Gold is 100% bright! Measures 6" tall to the top of the finial. Update: This is actually part of a dresser set, and is one of the apothocary jars. Camart Limoges made this also. 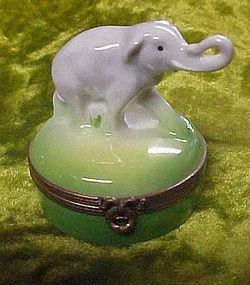 Take a look at this lovely Limoges porcelain, highly collectible Peint Main trinket box. Grey elephant with the trunk up stands upon what looks to be a grassy base. Measures 2 1/4" tall. Pristine condition. This appears to be an older one. 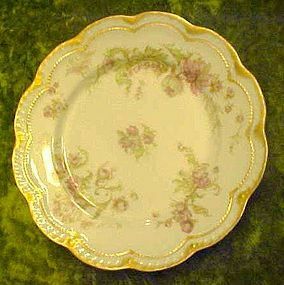 A Beautiful Haviland Limoges France salad plate. Schleiger style with sprays of pastel florals of pinks and soft greens. Gold brushed border with scalloped inner border. 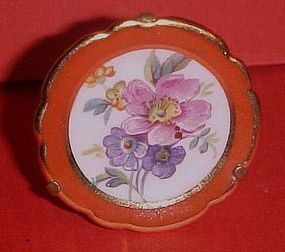 Measures 7 1/2" in diameter Excellent condition with no wear. MArked with green backstamp and red back stamp also. 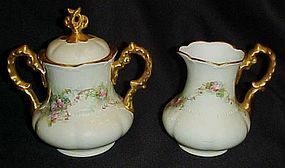 Traditions fine china, Johann Haviland China corporation, the backstamp reads. 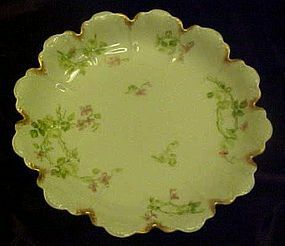 Moss rose pattern with gold rim trim. 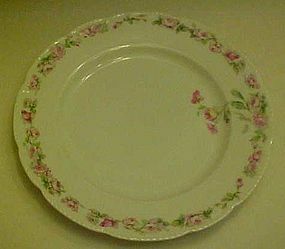 Bread and butter plate measures 6 1/4" in diameter and is in perfect condition with no wear visible.